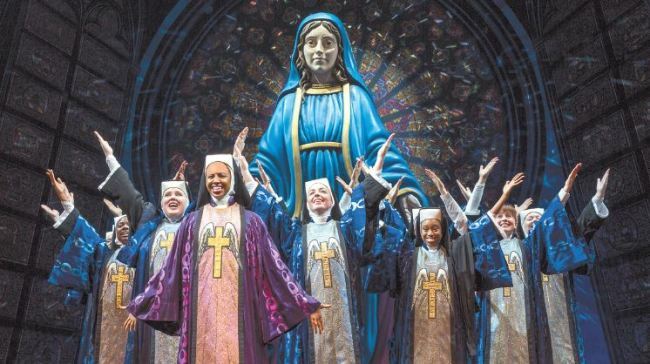 Two and a half decades ago, a musical movie starring Whoopi Goldberg as a lounge singer who stumbles upon a murder scene and ends up in a place she does not belong -- a Catholic convent – hit the silver screen. The cast’s performance and music elevated the typical fish-out-of-water story, as it became a box office hit and generation-defining comedy. The musical adaptation of the film landed in Korea last week, bringing with it the humor, music and charm that made the original story so popular among fans. Unlike the movie, the musical is set in 1978 Philadelphia, which is the perfect setting for the disco and soul-style music drawn up by Alan Menken for which Glenn Slater provided the lyrics. Although fan favorites like “I Will Follow Him” and “Oh Happy Day” are missing, the new style fits perfectly with the flamboyant and free-living nature of protagonist Delores Van Cartier, played by Dene Hill. Right from the start, Hill commands the stage with opening numbers “Take Me to Heaven” and “Fabulous, Baby.” Her powerful voice illuminates the reincarnated city of brotherly love, as the play follows Delores stumbling across a murder committed by her gangster boyfriend Curtis Jackson. Brandon Godfrey, who specifically said he wished not to play Curtis as your typical bad guy, looks like he was born to play the part of the cruel, slimy, yet somewhat likeable villain. His baritone in “When I Find My Baby” is a delight to the ears, and you might find yourself almost cheering for the guy -- that is, before realizing that the lyrics sing about how he wants to mutilate his girlfriend to stop her from squealing. Standing opposite the vulgar Delores is Mother Superior, played by Rebecca Mason-Wygal. Her vocal, which actually sound like one that could be found in a church choir, is a pleasant contrast to Delores’ soul vocal. Mason-Wygal’s stern tone gives off the feeling of someone you do not mess with, but seek approval from. Will T. Travis’ role of Eddie Souther may look like just another heart-of-gold character -- which he is -- but it works in such a bubbly, heartfelt comedy piece. One particular nun, Sister Mary Lazarus, played by Nancy Evans who shows impressive rapping skills, even became a favorite among Korean fans, earning the nickname “Halminem,” -- a combination of the word for “granny” and US star Eminem. The audience was on its feet by the time the show had reached its climax with “Spread the Love Around,” wrapping up a feel-good piece with a bang. One bonus for those who understand written Korean: pay attention to the Korean translation, which is just hilarious. The show is being held at Blue Square in Yongsan-gu, Seoul, through Jan. 21. Tickets range from 60,000 won to 140,000 won, and are available for those aged 7 and above. Call 1544-1555 or visit Interpark’s homepage. The show starts at 8 p.m. on Tuesdays, Thursdays and Fridays, at 3 p.m. and 8 p.m. on Wednesdays and 2 p.m. and 7 p.m. on weekends and holidays. There are no shows on Mondays. The show lasts 2 1/2 hours and has a 20-minute intermission.